Carla studied massage at the New Center: New York College for Health Professions and has been a freelance NY State licensed massage therapist since 1991. She is certified for Pregnancy Massage under study directed by Elaine Stillerman, LMT and certified as well for Table Thai Massage by the Nayada Institute of Massage. Carla Gargano has based her practice in the Hamptons located in the East End of Long Island, NY. From NYC to the Hamptons Carla is covering all the Hamptons including Southampton, Watermill, Bridgehampton, Sagaponack, Sag Harbor, Amagansett and Montauk, Shelter Island and the North Fork. Over the past 20 years Carla has continued to integrate her knowledge by studying and completing various holistic certifications and licenses. A graduate of Anne Marie Colbin’s Natural Gourmet Cooking School, Carla serves as a nutritional coach and mentor for juice fasts and cleanses as well as lifestyle changes. 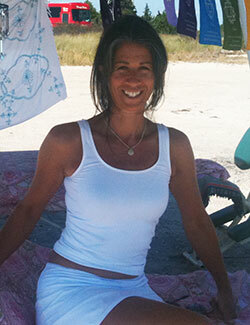 Carla is a certified yoga instructor under the YogaZone program led by Alan Finger. Carla is currently enrolled in a 300 hour teacher training with Rodney Yee at Yoga Shanti. She is also a NYS licensed aesthetician.